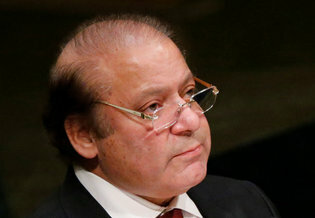 ISLAMABAD, Pakistan — Under pressure from Pakistan’s military, Prime Minister Nawaz Sharif ousted two of his top officials on Saturday in a continuing standoff over leaks to the news media of a meeting at which civilian leaders confronted the military over its alleged reluctance to halt Islamist groups in the country. Saturday’s dismissals were the latest chapter in a showdown over a news story published in October that has infuriated the military. In the article, unnamed sources said government officials bluntly confronted the military over its lassitude in going after militants, saying that the country could be ostracized by the international community. The removal of the two officials on Saturday, however, did not mollify the country’s powerful army, and seemed to have the opposite effect. Maj. Gen. Asif Ghafoor, a military spokesman, said in a Twitter message that the army rejected Mr. Sharif’s effort, and insisted he make public the results of an investigation into the leaks and put its recommendations into effect. Two U.S. special operations forces soldiers killed in eastern Afghanistan on Wednesday may have been struck by friendly fire in an operation targeting the emir of Islamic State militants in Afghanistan, the Pentagon said on Friday. Pentagon spokesman Captain Jeff Davis told reporters that the military was investigating whether the two troops may have been killed by ground fire, either by American forces or Afghan commandos taking part in the raid, though it appeared to be accidental. Earlier in the day, the Pentagon identified the soldiers as Sergeant Joshua Rodgers, 22, and Sergeant Cameron Thomas, 23. A third soldier was wounded in the operation. Like previous years, the Taliban outlined its goals for the coming year’s spring offensive. In the “political sphere,” the Taliban said that “particular attention will be paid to establishing mechanisms for social justice and development,” “institutions will be erected,” and “special dawah [proselytizing Islam] and propagation apparatus will be set up” in areas under Taliban control. Maulvi Daud, a former Taliban governor of Kabul, was shot dead near the Pakistani city of Peshawar, officials confirmed Saturday. A gunman sprayed bullets into Daud’s car near the Shamshatoo refugee camp in Peshawar. Daud’s driver and another person were killed in the attack. The Islamic State claimed responsibility for the attack, but the Taliban said the attack was carried out by Afghan intelligence. Officials also said the attack was a rare clash between IS factions. Thousands of people attended Daud’s funeral on Friday. Daug was among more than a dozen Afghan leaders who had been detained in Pakistan but freed at the request of former Afghani President Hamid Karzai. American policy toward China depends heavily on whether national security leaders view China as ascendant relative to the United States. Though U.S. policymakers often assume that Washington will soon be eclipsed by Beijing, in truth the United States is widening the wealth gap with China, as the Chinese economy continues to flounder. This fact is frequently obscured, however, in large part because of Beijing’s successful military modernization as compared to America’s decimated global combat power. Indeed, despite the fact that it is falling even further behind the United States economically, China has managed to change Asia’s balance of power. These military trend lines contribute to the dominant perception in American policy circles that China is on an inevitable path to overtake the United States economically and become Asia’s principal power. Without a doubt, surpassing the United States in Asia is Chinese President Xi Jinping’s aspiration. 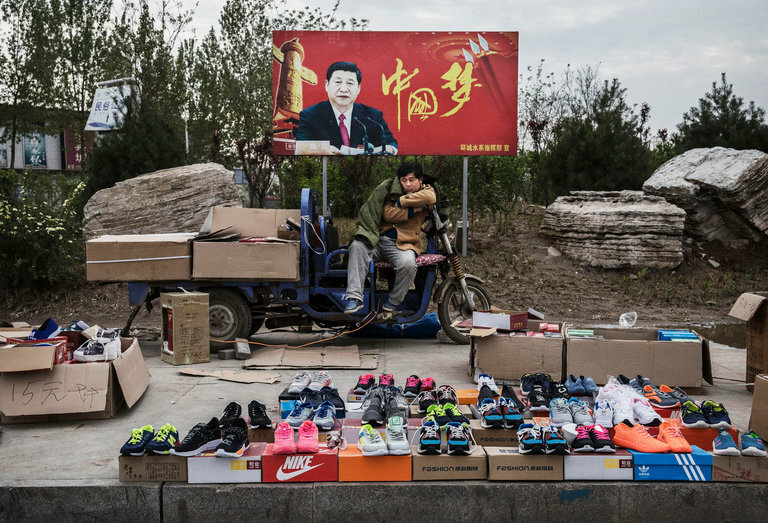 But while he inherited a China far wealthier and more powerful than it had been in decades, China’s economy is in the process of stagnating, and Beijing’s economic approach shows no signs of changing. The idea that the 21st century would be defined by a “power transition” from American to Chinese dominance is not unreasonable. After all, China experienced dizzyingly high growth in the 1980s, ‘90s, and into the early 21st century as its economy was reforming along free market lines. This phenomenal growth made an understandable impression on American observers of China -- in no small part because of its association with a military modernization that is now bearing fruit. When a regional military balance changes, the actual economic numbers seem to matter less. That the military needs intelligent officers is not a particularly controversial statement. Underpinning that argument, however, is the assumption that the military normally recruits, recognizes, and retains its intellectual capital. Two recent studies cast some doubt on this. In his excellent new book, defense expert Eliot Cohen argues for the necessity of maintaining premier military capability. As part of that military capability, Cohen notes that the military “need[s] … professional officers with both operational and intellectual training as well as access to classified material and recent operational experience, to contribute to high-order thought about the nature of war.” Aside from noting that “by and large [the military] does not produce its own intellectual capital,” Cohen does not dwell on the issue. The situation may be far grimmer than Cohen states. More than merely not developing high-end intellectual ability, recent evidence shows that the military fails to recruit intellectual capability to the same degree as in by-gone generations and discriminates against the intellectual capital it does possess in promotions and selections. In Joint Force Quarterly, Matthew F. Cancian showed the long-term trend in intelligence among Marine officers. Comparing the absolute scores on the General Classification Test (GCT), new Marine officers started a long-term downward trend in intellectual capability starting around 1980. Of concern, “two-thirds of the new officers commissioned in 2014 would be in the bottom one-third of the class of 1980; 41 percent of new officers in 2014 would not have qualified to be officers by the standards held at the time of World War II.” Though data for the other services is not available, Cancian suspects that a similar trend has occurred in them as well. ** A Vote of Confidence for the European Union? After weeks of worry, EU institutions and governments can heave a sigh of relief. The scenario they most feared in France's presidential election — a runoff between two anti-globalization candidates — did not come to pass in the first round of voting on Sunday. Instead, centrist leader Emmanuel Macron wound up in first place, and opinion polls suggest he will defeat the populist Marine Le Pen in the elections' second round May 7. Stock markets in most European capitals rose Monday morning, buoyed by the vote's outcome. But though the results suggest that the status quo in Europe will survive another day, the political situation in France offers little room for complacency. The Dark Side Of Digital Revolution: Can India Stand Up To The Challenge? It would not do for people to find out all of a sudden that their bank accounts have been cleaned out, or that your BHIM and Aadhaar data are available for sale on the Internet. Some people are raising questions about Aadhaar and about Electronic Voting Machines (EVMs). It is hard to dismiss them out of hand even if you make allowances for their vested interests. The reason is that, fundamentally, computer and network security in India is in its infancy. As the country is dragged kicking and screaming into a future with electronic money and electronic identity and electronic everything else, it is pertinent to worry about how things can go wrong. The objectives behind Aadhaar and the EVM are laudable: it makes sense both to have an unalterable identity mechanism and a way of quickly and accurately tabulating election results. Indeed there is a case for even greater introduction of digital mechanisms into daily activities: for instance, we need land records and medical records to be reliable and portable. So the thrust behind Digital India and India Stack is doubtless, sensible. The devil is in the implementation details. The U.S. bombing of an Islamic State stronghold in eastern Afghanistan two weeks ago, and Thursday’s news of two service members killed in an anti-Islamic State operation, are needed reminders of why we still have troops in Afghanistan. In mountains near those that once hid Osama bin Laden, a terrorist group that seeks to attack the United States is again seeking sanctuary. Last weekend’s devastating attack on an Afghan army base in Mazar-e-Sharif that killed more than 140 soldiers is a grim reminder of the challenges confronting the Trump administration as it completes its Afghanistan strategy review. How can the United States eliminate international terrorist threats emanating from Afghanistan while the Afghan government is fighting a war of attrition in which the Taliban has gained the upper hand? During a U.S. Institute of Peace visit to Pakistan and Afghanistan this month, we met with senior officials and civil society and business leaders. Based on those discussions, we believe the solution lies in Afghan and regional politics, not just on the battlefield. The United States should shift its strategy to prioritize reaching a political settlement based on the Afghan constitution among all Afghan groups, including the Taliban. In doing so, the Trump administration can move from a policy of avoiding failure to one of achieving success. The Taliban has unleashed its annual so-called “spring offensive” in Afghanistan, saying it will mainly target U.S.-led foreign “occupation” troops to force them to quit the country. In a formal announcement released Friday, the Islamist insurgency claimed “Operation Mansouri” went into action early Friday morning across all 34 Afghan provinces. It explained the offensive has been named after Taliban chief Mullah Akhtar Mansour, who was killed by an American drone last year. “These operations will involve conventional attacks, guerrilla warfare, complex martyrdom (suicide) attacks, insider attacks, and use of IEDs (improvised explosive devices) to achieve their objectives,” said the statement by the Taliban’s so-called leadership war council. While there has been no letup in insurgent attacks in Afghanistan over the past several years, the onset of springtime militants to ramp up their activities because melting snows on mountain peaks allows insurgents to launch major battlefield attacks. Friday’s announcement came a week after the Taliban staged its deadliest raid on a major Afghan military base in the northern city of Mazar-i-Sharif. When President Xi Jinping of China took power almost five years ago, he quickly gained control of the commanding heights of the Chinese party-state, taking charge of the military, foreign policy, domestic security and a fearsome anticorruption commission. In centralizing decision making in his office, Mr. Xi also grabbed hold of something his two immediate predecessors never did during their lengthy stays in office: He placed himself in charge of economic policy. Mr. Xi’s authoritarian instincts have served him well politically. Chinese leaders from Mao Zedong onward have always had rivals among senior leaders. As he looks ahead to securing a second five-year term at the Communist Party Congress in the fall, Mr. Xi appears to have none. With this enormous power, Mr. Xi has pushed through once-in-a-generation changes in military structure and personnel, built a new national security council, pressed China’s claims in the South China Sea and overseen the largest antigraft campaign since the 1949 Communist Revolution. The Treasury’s inquiry follows a subpoena sent to Huawei this summer from the United States Department of Commerce, which carries out sanctions and also oversees exports of technology that can have military as well as civilian uses. 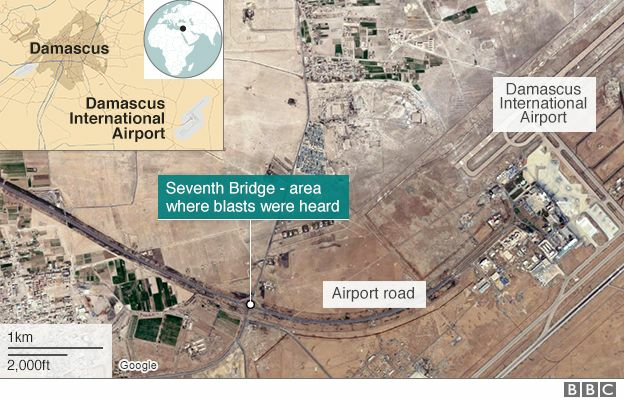 An Israeli missile strike has caused a large explosion and fire at a military site near Damascus international airport, Syrian state media report. A fuel tank and warehouses were damaged, the Sana news agency said. But Syrian rebel sources said an arms depot run by Lebanon’s Hezbollah movement, which is fighting in Syria as an ally of the government, was hit. Israel said the explosion was “consistent” with its policy to prevent Iran smuggling weapons to Hezbollah. ARMY WAR COLLEGE: The brutal ground war in Iraq holds vital lessons for sophisticated future operations in the Pacific, Australian Maj. Gen. Roger Noble said today. Military pundits often draw a sharp distinction between what they consider low-tech warfare against irregular forces, as in Iraq, Afghanistan, and Syria, and high-tech war against states like China and Russia. But when Noble went from a tour in Iraq last year to the Hawaii headquarters of US Army Pacific, he said, the cutting-edge concepts of Multi-Domain Battle that USARPAC is experimenting with forcefully reminded him of coalition operations against Daesh, the self-proclaimed Islamic State. Multi-Domain Battle calls on the services to break out of their traditional comfort zones and extend their reach into each other’s domains so they can support each other and attack the enemy from multiple angles at once. That requires the military to develop not only new weapons — from cyber tools like Stuxnet to shore-based anti-ship missiles — but new systems of command, control, and communication to bring the disparate efforts together. When soldiers prepare to deploy to a conflict zone, it is logical for them to learn as much as possible about the area in which they will be operating. The enemy already has the home-field advantage; it is only appropriate to mitigate that advantage by learning as much as one can about the land and the people who live there. Additionally, it is important to learn more about the growing power of nonstate groups, the mounting importance of multinational organizations, and the shifting cast of allies and partner nations that may become involved in operations for their own purposes, and how each adds complexity to, and affects, operational environments. To our Army’s disadvantage, it must remain adaptable to fight across the geographical spectrum, which means it is compelled to train generically when there is no known specific threat or target. Therefore, there will be a shortage of time to train on specific geographical areas and focus on familiarizing the force with specific cultures as unexpected contingencies arise. However, even in the face of so many unknowns, experience has shown that there are constants that can be expected to emerge as factors during most foreseeable operations. These can be anticipated and our forces should prepare to deal with them. Among these are constants that were not fully recognized until comparatively recently. Russian and Chinese “cyber-communities” have been actively researching and sharing information on the recent Shadow Brokers leak of alleged NSA attack tools, suggesting cyber-criminals and state hackers could be looking to capitalize on unpatched systems around the world, according to new data. Recorded Future has been monitoring the darknet for mention of specific keywords associated with the new trove, which came to light a fortnight ago. It features codenames such as EternalBlue; EmeraldThread and EternalChampion, referring to exploits developed mainly to target Microsoft systems. Although Redmond claimed in a speedy response that none of the tools work against supported products, there’s still danger for organizations running either unsupported systems like XP or those who aren’t up-to-date with their patches. That danger was highlighted by intelligence from Recorded Future this week which revealed a lot of chatter in Russian and Chinese forums about the data dump. Several tools have already been reverse engineered, with exploit framework FuzzBunch, SMB malware EternalBlue and privilege escalation tool EternalRomance stoking particular interest, the firm claimed in a blog post. As one of the 97 countries to ratify the Paris Climate Change Agreement which came into force last year, the United States government has been starting to show signs that it takes the threat of global warming seriously. As our infographic below shows, this proactive approach is supported by 79 percent of the population. Despite this, only 36 percent of US citizens see climate change as a serious problem - compared to 52 percent globally - and when asked if they would be prepared to contribute an extra dollar each month to combat the issue, almost half said they would not. This chart looks at the US attitude towards climate change in 2016. By Tuesday evening, several Indian websites had been hacked by a group called Pakistan Haxors Crew, who claimed that the attack was a payback for hacking websites in Pakistan, including the Pakistani Railways website. On Tuesday, the websites of Indian Institute of Technology Delhi (IIT Delhi), IIT Varanasi, Aligarh Muslim University (AMU), Delhi University (DU), University of Kota, Army Institute of Management and Technology, Greater Noida; Defence Institute of Advanced Technology; Army Institute of Management, Kolkata; National Aerospace Laboratories and Board of Research in Nuclear Sciences (BRNS) had been breached. By Wednesday evening, the Kerala Cyber Warriors had begun their payback. They hacked the website of Bahria Journal of Professional Psychology and this time, putting the Malayali sense of humour on showcase, the group has put up a conversation, which includes teaching Malayalam alphabets on the homepage. These counter attacks aren’t a recent development. This attack came about after ‘Kerala Cyber Warriors’ hacked a few Pakistani government websites a few days ago to protest the death sentence given to the alleged Indian spy Kulbhushan Jadav. Industry experts and federal agencies such as NSA, NASA and NIST have repeatedly pushed for the implementation and standardization of the bare essentials of Information Security, such as security-by-design, cyber-hygiene training, and layered defenses, to be recognized as crucial topics on the Hill. The Cyber Shield Act is an excellent idea for improving informed consumer decision making concerning electronic devices and introduces meaningful dialog between industry and Congress in a manner that shifts the conversation away from counterproductive, bureaucratic partisanship. If developed and implemented meaningfully, The Cyber Shield Act would not only empower consumers, but would facilitate a much-needed cultural shift in secure device manufacturing and upkeep. In this this analysis, entitled “The Cyber Shield Act: Is the Legislative Community Finally Listening to Cybersecurity Experts?” The Institute for Critical Infrastructure Technology discusses how The Cyber Shield Act has the potential to transform critical infrastructure cyber resiliency. Included in this analysis are specific recommendations and considerations including a discussion on meaningful criteria for security ratings and the importance of requiring security-by-design throughout the development lifecycle of devices. The Cyber Shield Act, security-by-design and other concepts explored in this paper will be discussed at The Annual ICIT Forum, June 7, 2017 in Washington D.C. Click here for details and to register for this important event. A new collaboration between the U.S. Navy and academia could help bring artificial intelligence to the fore in national defense. Indiana University and the Navy recently kicked off a new, multiyear commitment. The university’s School of Informatics and Computing will team with researchers at the Naval Surface Warfare Center's Crane, Indiana, division to incorporate machine learning and artificial intelligence into military sensor technology. In the initial phases of the collaboration, the Crane team will be generating realistic, military-type sensor data from a range of inputs in order to give the university researchers fodder for their testing. Kaspersky has identified almost 9,000 botnet command and control servers and hundreds of compromised websites in ASEAN countries. Cybersecurity firm Kaspersky Lab has joined the world’s largest police organization Interpol in a cybercrime operation involving public and private sectors across the ASEAN region, the company said on Tuesday. So far, Kaspersky Lab has identified nearly 9,000 botnet command and control servers and hundreds of compromised websites, including government portals. In the operation, cybercrime investigators from Asean countries including Indonesia, Malaysia, Myanmar, Philippines, Singapore, Thailand, and Vietnam exchanged information on specific cybercrime situations in their respective countries. China also contributed with an additional cyber intelligence report. “Public-private sharing is a critical step in fighting cybercrime in the region. But for this operation, access to intelligence and technology has been as important as the experience of learning from each other throughout the process, resulting in better understanding and collaboration between private partners and law enforcement agencies,” said Anton Shingarev, Vice-President Public Affairs of Kaspersky Lab. Denial of service (DOS) and distributed denial of service (DDOS) attacks are tools used by hackers to disrupt online services. The implications of these attacks can be wild – sometimes costing bigger companies millions of dollars. If you run a business that is potentially a target for one of these attacks, or if you’re just interested in the subject, read on for ways to defend yourself from these types of attacks. WASHINGTON — The new Senate subcommittee charged with oversight of military’s role in cyberspace announced it will hold a hearing on cyber-enabled information operations, which Russia is alleged to have employed during the 2016 U.S. elections. Former NSA Deputy Director John Inglis and former acting Under Secretary Of Defense for Policy Michael Lumpkin are set to testify with other outside experts. Defense News interviewed Armed Services Cybersecurity Subcommittee Chair Sen. Mike Rounds, R-S.D., who said his first priority for the new panel is simply getting a lay of the land. Beyond that beyond, he aims to press the administration to complete work on U.S. policy that would define an act of war in cyberspace. Foreign actors in cyberspace have reportedly been more aggressive lately, not necessarily hiding what they’re doing and maybe even testing the United States. Your thoughts? I think the Russians clearly knew we could see what they were doing with regard to the information they were dispensing. I don’t think there is any secret about that. I think we have to take each of our competitors separately. China clearly has capabilities, they don’t necessarily share them publicly. Iran and North Korea probably simply aren’t as capable as our peer competitors when it comes to hiding their capabilities. They’re not as adept. Then you have the problem children, the terrorist groups and the actual thieves, all of whom we have to have defense capabilities to stop from getting into our systems. They’re not as good as the peer competitors, Russia and China. While a major focus in the latest influence operation involving the 2016 election, cyber is only one small part of information warfare and information operations, according to some current and former officials. Cyber was the vector used to extract the information, but how the stolen information is used “is not necessarily a cyber issue,” Christopher Painter, Coordinator for Cyber Issues at the State Department said during a panel discussion in April hosted by the Carnegie Endowment for International Peace. Information warfare has happened for centuries, he added, and while cyber has been either an accelerant or an enabler for these types of activities, it is just a small part. Director of the NSA Adm. Michael Rogers told Congress last month that the “biggest difference was cyber to gain access to and extract information,” as it related to massive influence campaign perpetrated by the Russians in the 2016 presidential election. Similarly, Michael Chertoff, the second Homeland Security secretary, said during the same panel that this problem should be viewed through a counter-messaging lens. 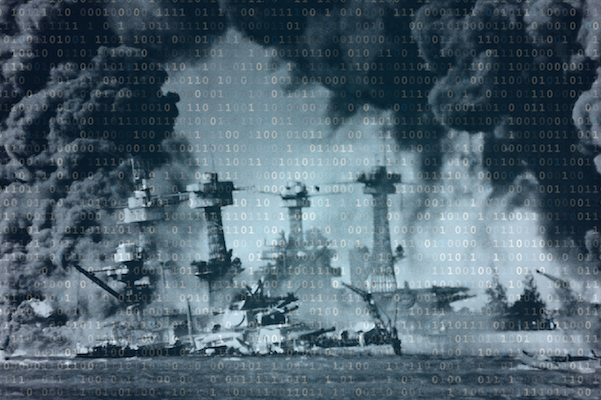 #GailForce: Has the U.S. experienced the long predicted Cyber Pearl Harbor? There is no need to wage a kinetic war or even to use debilitating cyber attacks on critical infrastructure if you can sway an election to elect a candidate or a party friendly to your interests or to defeat one you don’t like. What if in August of 2015, the FBI received credible intelligence that Russian operatives were planning to blow up the DNC headquarters building, and physically harm the Democratic Presidential candidate? What if the DNC headquarters was then attacked in June of 2016, an attempt was made to harm the Democratic nominee, and there was conclusive evidence from the intelligence community that the Russians were behind it all? What would have been the reaction of the U.S. government, the military, and the public? In the above scenario, I’m describing what military strategists refer to as a “kinetic attack”. What actually happened in June 2016 is called a “non kinetic” attack. There are many who still argue that unless death or destruction results, a cyber incident should not be considered an attack or an act of war. What they are missing is that cyber space has given nation states, or transnational groups, or single threat actors, the capability to effectively use information as a devastating weapon. The current buzzword is “weaponized narrative”. As the 2014 North Korean hack against Sony Pictures highlighted, cyber space is also a security arena where a private corporation may have to defend itself against an attack by a nation state.